Question 1: Identify the Topographic Pattern [Figure 1]. Is it Normal? Small central asymmetric bow-tie appearance in topography. 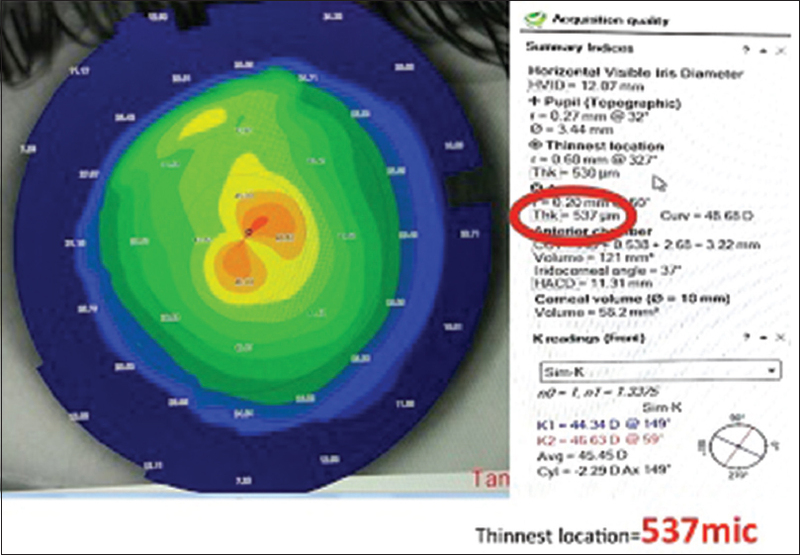 It is indicative of keratoconus in spite thinnest patchy of 530 mic which is within normal limits. Question 2: Rajeev C/o Blurred Vision of 2 weeks. He Gives a History of Taking a Nasal Spray for the Past 6 months. What Is the Diagnosis [Figure 2]? Name Any 3 Drugs (Other Than Steroids) That Are Reported to Cause This Condition. Central serous chorioretinopathy. Pseudoephedrine and oxymetazoline (nasal sprays), ephedra (contained in body-building dietary products), sildenafil, tadalafil, vardenafil, binimetinib used for metastatic cancer. Question 3: What Is the Diagnosis [Figure 3]? What Is the Associated Condition to Be Ruled Out? Bear-track lesions of congenital hypertrophy of the retinal pigment epithelium. A subgroup of these lesions has been associated with familial adenomatous polyposis (Gardner syndrome). Wyburn–Mason Syndrome. The typical lesion consists of markedly dilated and tortuous vessels that shunt blood flow directly from arteries to veins [Figure 4]a. 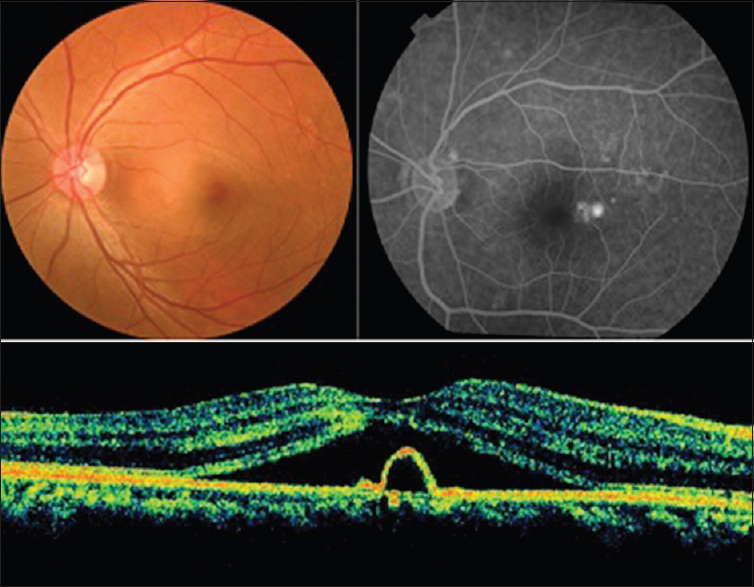 In Fundus fluorescein angiogram (FA), these vessels do not leak fluid [Figure 4]b. 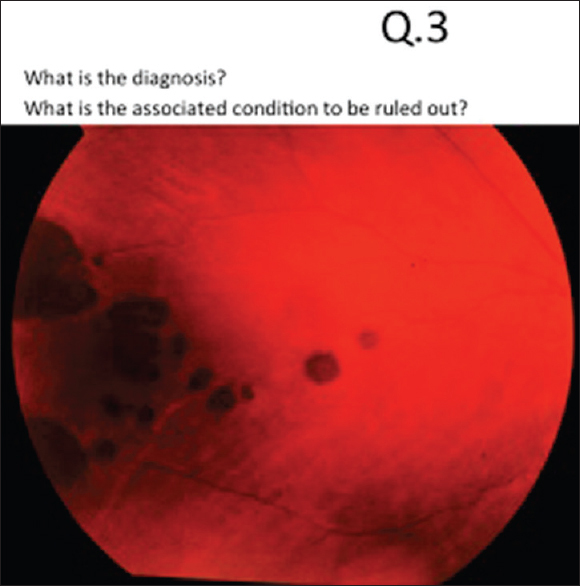 Question 5: Sometimes, You May Come Across a Patient With Proliferative Diabetic Retinopathy in One Eye and Non-Pdr or No Proliferative Diabetic (Dr) in the Other Eye. 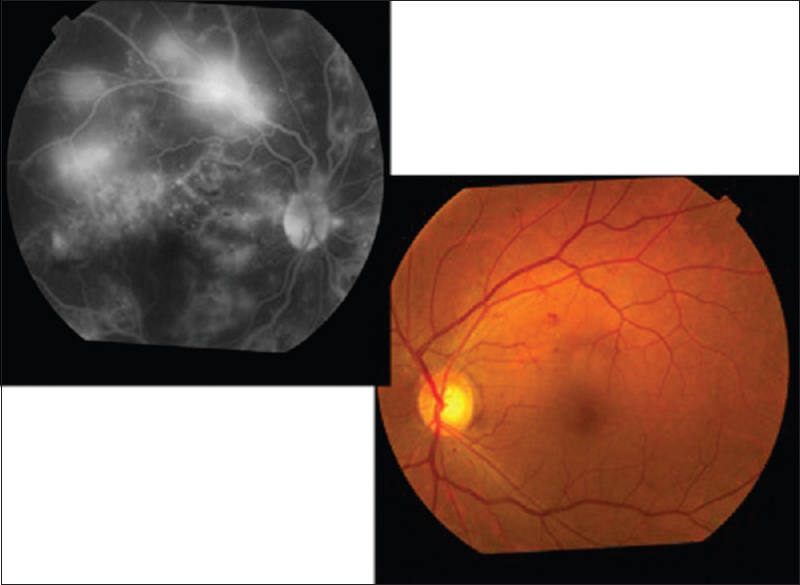 Name Any 3 Conditions You Need to Rule Out in Such Cases of Asymmetric Diabetic Retinopathy [Figure 5].